It is a great time waster. Sometimes I really need to learn to relax and waste time though, and not feel guilty about it. Good on you for piss farting Alicia. You won't find too much of interest on Facebook though in terms of quality. I read recently that lower class youth prefer FB while middle class youth prefer Instagram and somehow, it all just made sense right there! I do love Instagram, I am a visual person. You are right, not much interest on FB, but it can be useful. I put up a WTB on our local buy/swap/sell and a lady has kindly GIVEN me her entire worm farm for the gardens! I totally agree that the time you enjoy wasting is not wasted time at all! I call it relaxing! I love piss-farting around on FB and most of the time I don't feel guilty about it, unless I'm doing it to procrastinate and I end up getting nothing done. But most of the time it's just good fun! No Foxtel here either, though I am awesome at piss farting around, like gold medal awesome! In fact that could very well be what I am doing right this very moment! I totally agree with the whole time you enjoyed not being wasted time as well. Cleaning the toilet and bathroom however...that could easily be wasted time I think! Also worm farms are awesome, they make the best tea for your garden. I use the unsubscribe button on Facebook posts to keep things interesting. And I so agree with Megan's quote! I spent the weekend lying around, instead of thinking of it as wasting time, I'm gonna think of it as time that I enjoyed. We all need to mindlessly waste time every now and again, and not feel guilty about it! We use the word 'farnarkling' here. 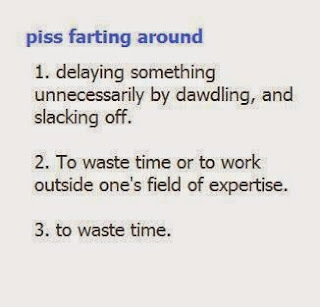 It basically means the same thing as piss-farting around. I might change to piss-farting just for a bit of variety. Funny you should say that about facebook - in the past 5 days I've barely been on Facebook. Mind you, I don't have a facebook page for my blog, so I'm just talking about personal use. I'm just sick of it. It's nice to check in, because I do love catching up with news from old school friends, etc, but having it open all day in a tab makes it too tempting to click over to it and waste time gazing at nothing much. Ooh I like 'farnarkling'. I could see me slipping that one into my vocabulary. Since I am not currently working I spent a hell of a lot of time piss farting around!! I have so much to do but at the end of each day when I think about what I have accomplished, some days it's a sweet FA! Who knows what I do, it's not Facebook so much, but definitely games.... I need to put a limit on myself! I really miss Gogglebox. I enjoyed watching that to catch up on all the reality tv I missed during the week! Haha, piss farting ... I tend to say fart arsing or muck farting. I do a lot of it, a lot of doing nothing useful with my time but maybe we need it sometimes, just not as much as I do. Maybe I should go and do something useful. Facebook, Instagram and Pinterest are like minefields for me...you keep digging deeper and find no way out! Wonderful tenderness, joy, beauty and happiness in those beautiful faces! I am a great piss-farter! haha.. Love it. I might use this term more often. I go round and round in circles on the internet some days and do feel a pang of guilt when hubs walks into a shambles of a mess... but I did enjoy it. I love "Any time you enjoyed wasting is not a waste of time!" It will be quoted around here in future too! I think my hubby is used to the mess haha. He knows by now how quickly a clean house becomes a minefield of mess!